Say “NO” to downtime and longer cycle times. Our Total Predictive Maintenance Program is designed to keep your equipment working at optimum efficiency, and protects the sizeable investment you’ve made. You can’t afford to miss out on our full CNC machine examination. Our technicians are experts at diagnosing problems before they happen. Technicians from REA Technologies are proactive solution oriented professionals. We’ll keep your electronics, motors, pumps, hydraulics, lubrication, axis movement, spindle, tool change functions and alignments all finely tuned. You'll benefit by maintaining high levels of precision, repeatability and achieving longer machine life. 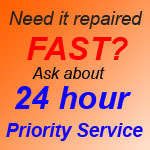 We review problem areas with you as service is being performed. We record and furnish documentation of all services that are provided. In addition to the service mentioned above, REA Technologies will provide “back-up” copies of your plc programs, hard drives and parameter listings. Call us to today to discuss how REA Technologies can provide you with the peace a mind in knowing that your equipment is kept in premier condition. You have the oil in your car changed on a regular basis, right? While you’re at it, you might as well rotate the tires and have the brakes, belts and hoses checked for signs of wear. Good idea, right? The same concept applies to your plant equipment. You can dramatically extend the life of your equipment by detecting problems before costly damage occurs. 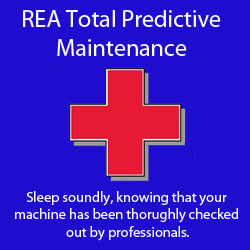 Have a REA Service Technician keep your machines in top working order so that you can do what you do best – make money! * If applicable; additional charges may apply.